Eleuthera, first published in 2011, now has two books in the series. 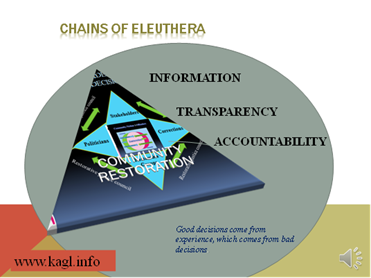 The first book, ELEUTHERA: IMPROVE CORRECTIONS AND SAVE OUR COMMUNITY, Dr. Garth-James proposes that corrections managers need to focus their attention on helping prisoners gain literacy and marketable job skills that will aid them in finding Eleuthera, or true freedom, upon their return to society. In the second print, Eleuthera: Improve Corrections’ Performance and Save Our Communities with Elearning and Work Models, Dr. Garth-james emphasizes Education models using distance technology (eLearning) and curricula infused with critical literacy theory and joint venture work projects that teach marketable job skills and pay marketable wages for taxes, victims restitution and forced inmate savings, are pragmatic alternatives to just lock’em up. See the full descriptions and/or purchase the books here. 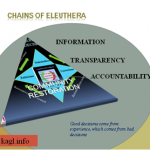 Learn more about the Chains of Eleuthera model by watching the PowerPoint presentation or by reading the mini booklet that goes in depth about community restoration and three key factors.